" The sun faded beyond the distant mountains. The warrior marvelled to find himself still standing, bloodied by friend and foe alike, but alive. His spirit sank into desolation despite his body's survival. He found no glory in victory. Only weariness, and the sense of loss. Perhaps a new dawn would bring fresh glory, but in the withering light of destruction's triumph, he sought only meaning. " The above wonderful caption was written for this image by the Fantasy writer Jaq D. Hawkins. Thank you Jaq, I think you did an excellent job. To learn more about the author visit her website at www.jaqdhawkins.co.uk. 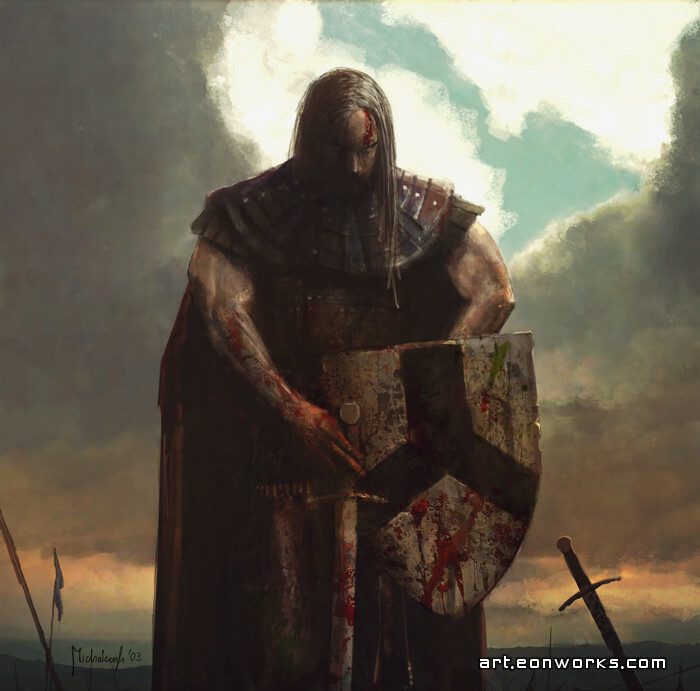 A depiction of a warrior during a moment of reflection after a tough and bloody battle... I started this painting back in 2003 after a difficult period in my life. I worked on it for a couple of weeks and then almost totally forgot about it until recently. Although I never found the inspiration to finish it, I think it's good enough to be in the gallery. This is truly a majestic painting and captures the soldiers/warriors agony when they realize the horror and carnage they've been through. They don't find glory, they don't look for high fives, they empathize and care for the lose. Very, very impressive painting. The skill is well enough, but the eye has captured the raw emotion of post battle emotion. this image is haunting, brilliant, and insightful. Love it. Very well done, it expresses the fertility of loss and deepens the feeling sadness umong mixed feelings of fear and fatiuge while illistrating a sense of heroism through might, compassion, and discipline. truly, a work of inspiring art not fit for a culture based on its own demise of war and dispare, it provides a keen look into our own self-realization. I love this painting! It makes me feel alive. You are truly a great artist. Thank you.